Miami Dolphins center Mike Pouncey, who was Aaron Hernandez’s teammate at Florida, was served with a grand jury subpoena on Sunday after the New England Patriots defeated his Miami Dolphins in Foxborough, Massachusetts. 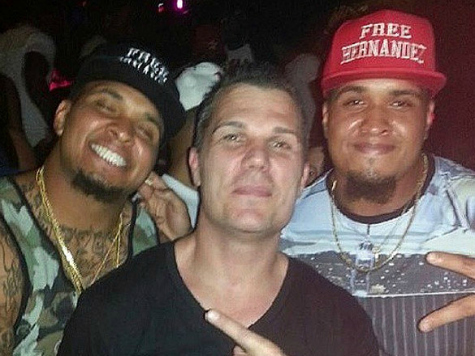 A grand jury subpoena does not mean Pouncey, 24, has been or will be charged with a crime. Rather, law enforcement officials regard him as a material witness who could advance their case against Hernandez. Dolphins officials indicated that Pouncey would be traveling back home with the team Sunday night. Pouncey has a twin brother, Maurkice, who is a center for the Pittsburgh Steelers who had season-ending surgery, and both of them donned “Free Hernandez” hats earlier in the year. Hernandez is accused of first-degree murder of Odin Lloyd and is being held in jail without bail.